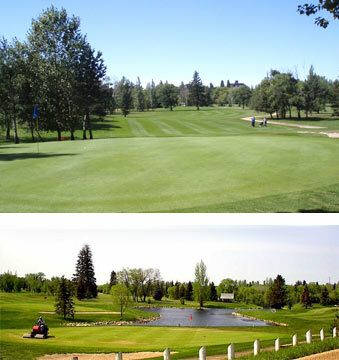 Tisdale Riverside is a challenging, fun and much-loved nine hole course in friendly Tisdale, Saskatchewan. Bring your ‘A’ game if you want to post a great score, or just bring your pals and have fun and then relax on the deck at the clubhouse. Tucked alongside the Doghide River, you’ll find water in play all over the place, tight fairways and wonderful scenery. We’re only a minute or two from downtown, but the natural beauty of our golf course will remind you just how pretty this part of the world can be. Make sure you stop in at the Riverside Grill and Lounge for a quick bite or a relaxing drink on the balcony overlooking our course. Get a delicious dinner and reflect on a great day at the golf course. The Tisdale Lions RV Campground is just a 9 iron away and the selection of unserviced to full-serviced sites will give you the camping experience you need after a long day on the road. We have on-site washroom and shower facilities and of course, golf just down the road! Check out the “RV Camping” link to see what we offer.